After a pretty hideous week in the mind last week culminating in an awful 10k, this week started off in the same vein at track after I dropped out of my group after the first set as I couldn’t keep up. (We were doing 4 x 800 easy followed by 3 x 300 fast with 30s rest between everything.) But no! What is this charging towards me? Trevor. He would not have it that I was too slow and he dragged me round until I’d caught back up with my group. He then took it upon himself to run the whole session with me shouting at me all the way and lo and behold I could do the session. This is exactly what I need. Someone running every step of the way with me swearing fulsomely and not letting me give up. Luckily Trevor was taking it a bit easy after Bright10 so he didn’t ruin his session by massively enhancing mine. Thanks Trevor! Buoyed by the brilliance of Trevor on Monday I set off for Tom’s Tuesday evening session looking to improve on the last time I did this session: 6 x 1 mile. Last time I did them all in about 6.40+ (I think, they’re in my old diary which I’ve put away and can’t be bothered to look at). I comfortably ran the first mile in 6.29 which was perfect as I want to be under 6.30 every time if possible. I hoped I hadn’t peaked too soon though didn’t think so as I was running strongly but not going overboard. There was only 90 seconds recovery between reps so I was very pleased and a little surprised when I completed the next 5 miles in 6.28, , 6.32, 6.33, 6.30 and 6.25 (let’s say the ones over 6.30 were due to dogs and not being able to press stop on watch). Anyway they were very consistent and I didn’t feel at any stage that I was really killing myself. On Wednesday I felt I should do an LSR to balance out all these speedy intervals and enlisted my trusty LSR partner Rob. The weather was pretty horrid. Very wet which meant my hands were frozen solid within minutes regardless of gloves. However we got an hour and a half of time on feet in the bank. In the evening it was back to the seafront for various % effort sprints of differing distances. Thursday was another of Tom’s seafront sessions. 8 x 800. Averaged 3.10s last time. 90s recovery. 3.06, 3.03, 3.04, 3.05, 3.04, 3.03, 3.03, 3.02. I was very pleased with these as I didn’t feel I was trying overly hard. 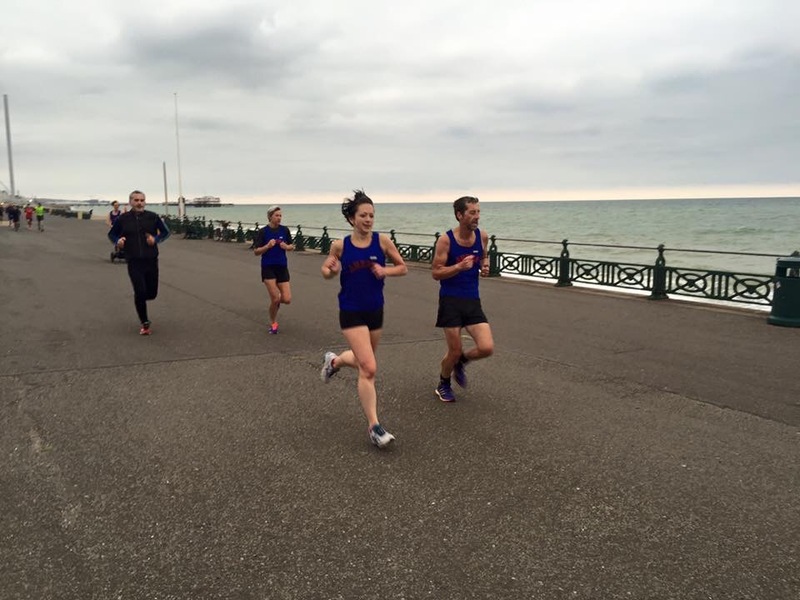 There was no hands on knees at the end of the reps.
Next up was Arena super series Hove Prom parkrun. Naturally after many weeks of calm conditions it was rather windy. However after a stern talking to from Trevor I set off remembering that this was a race for position (within the Arena contingent). I found myself running with Kerry throughout. Tara had disappeared into the distance early on. Rick came past around 3k as usual but, not as usual, I actually worked to keep with him and Kerry. As we took the last corner I knew I should be able to do a traditional Isobel and pip Kerry to the post in a windmilling sprint if necessary. It was. So I did. Third lady over the line, second Arena and 2 super series points in the bag. A good run, where I actually raced for position. Excellent. My time was ok too taking into account the wind. 20.41. This week was good so hopefully I can keep it up next week without succumbing to the seemingly inevitable cold that appears after a few good training weeks. 31 miles for the week. Genuinely don’t know how you do it- looks like an intense week! I was looking at joining Kent AC (weirdly in London) and then I looked up their track sessions and they look like suicide lol! One day! Join! They might be like Arena and have different sessions for new people so as not to kill them off first thing.